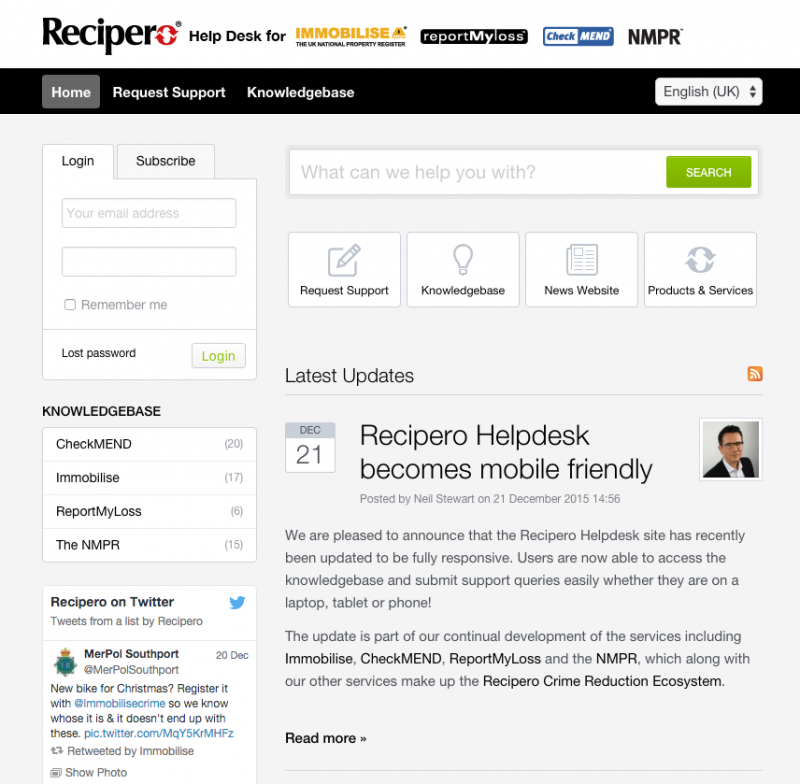 We are pleased to announce that the Recipero Helpdesk website has recently been updated to be fully responsive. Users are now able to access the knowledgebase and submit support queries easily whether they are on a laptop, tablet or phone! The update is part of our continual development of the services including Immobilise, CheckMEND, ReportMyLoss and the NMPR, which along with our other services make up the Recipero Crime Reduction Ecosystem. Users continue to be able to email support via the usual addresses published on each of of our product sites if they prefer. However we recommend creating support requests via the support portal, as the solution to many queries may be automatically suggested which in many cases, can answer queries straight away! Christmas brings the busiest shopping weeks of the year and for many retailers often accounts for 70% of their annual revenue. Stocking our homes with the latest electronic gadgets, jewellery and must-have accessories is commonplace, unfortunately though it provides thieves with an increased incentive to commit burglaries. TIP 1: Deterring would-be criminals is one of the most effective forms of crime prevention. Invest in a motion sensor flood-light or even some outdoor Christmas lights to highlight your home’s exterior. This will hopefully make approaching your home too conspicuous for a burglar. Also, highlighting the fact your possessions are security marked and registered on Immobilise using window decals provide a further warning that your goods are traceable and not worth the risk of stealing! TIP 2: Festive lighting – be secure. A common mistake of many festive decorators is to feed extension cables through partially open windows, criminals know to look for this vulnerability. When it comes to outdoor lighting, opt for solar or battery operated lights or install outdoor electrical outlets. TIP 3: Dispose of gift packaging carefully. Refuse collections over the Christmas and New Year period are normally at different times. If you can’t take packaging to a recycling point, make sure you only put your rubbish out just before the collection and do your best to break apart boxes so that they do not advertise your new contents of your home to thieves! TIP 4: Be careful not to advertise your home to burglars on social media! According to one recent study, social media is a commonly used tool for scouting potential targets. Social media savvy families have a tendency to publish their whereabouts during the holiday season, including any vacation plans. This can let burglars know when your house is going to be empty. Uploaded photos of pricey Christmas gifts can also be a problem as if privacy settings aren’t tied down, it can allow burglars to go shopping just by viewing your Facebook profile. TIP 5: Check doors and windows for weak spots. Government statistics show that 30% of burglaries happen through windows. Installing a few dead-bolts and new window hinges could increase the security of your home exponentially. TIP 6: Keep your curtains, drapes and window blinds closed at night, making sure valuable items are out of sight. When going out for the evening make use of inexpensive timers to give the illusion of occupancy, you should also consider leaving a radio on or go further and invest in a Fake TV device to emulate the light given of by at television. TIP 7: Away over Christmas – plan ahead! If you’re going away at Christmas be sure to cancel newspaper or milk subscriptions. Arrange for a neighbour to park on the driveway to help create the impression someone is home. Don’t leave overly descriptive telephone answering machine messages and again make use of light timers, radios and devices like Fake TV’s. TIP 8: Secure garages and sheds. Make sure that garden tools or ladders that could be used to force entry into your home are not left lying around or accessible from an unlocked garden shed. Garages are often targets for burglars looking for tools, bikes and gardening equipment – make sure the garage is secure and your possessions are secured too in the case of bikes and tools. Naturally make sure anything portable / valuable is recorded on immobilise. TIP 9: Don’t hide keys and use alarms if you have them. Burglars know to look for hidden door keys so don’t hide spare keys under rocks, in flowerpots, or above door ledges. Instead give the spare key to family or trusted neighbour. Many houses these days have alarms, many though are rarely set, make sure yours is on and protecting your home when you are away and overnight where possible. TIP 10: And lastly, don’t forget to register your gifts on Immobilise (www.immobilise.com)! Most gadgets have a unique identification code such as a serial number or for mobile phones an IMEI number – This IMEI number can be found quickly and easily by pressing the following keys on your mobile handset: *#06#. If your gift doesn’t have a unique identifier there are several affordable marking kits available from the Immobilise store allowing the police to easily identify the owners of items they recover and so detect crime. We hope that you find these tips useful and encourage you to share them with your family, friends and colleagues. As always please remain vigilant and report suspicious activity immediately to the police on 999 if a crime is in progress, 101 in a non-emergency or Crimestoppers, anonymously on 0800 555 111. Recipero is pleased to announce its partnership with SaferGems, a service provided by the British Security Industry Association (BSIA). Focusing initially on jewellery and watch traders, the partnership is set to dramatically improve the benefits of the SaferGems Watch Register service which helps members report and be alerted to lost and stolen items. The Watch Register is operated by SaferGems, a joint initiative established by the BSIA in partnership with a number of prominent organisations including TH March Insurance Brokers, the National Association of Goldsmiths (NAG) and the British Jewellers’ Association (BJA). In 2014 alone, over £9m worth of watches was stolen from individuals and jewellery stores, often inadvertently being sold on through the UK’s wide network of pawnbrokers and second-hand jewellery traders. Intelligence gathered by SaferGems shows that watches are among the items of personal property most targeted by thieves, with jewellery shops also frequently targeted by ‘smash and grab’ opportunists and organised gangs. Whilst reviewing the operational needs and costs of providing a fast and easily accessible checking service for Watch Register, it became clear that Recipero’s CheckMEND service already provided a very comprehensive service that is well proven in thousands of retail premises nationwide and with a little cooperation could incorporate the Watch Register data that we already hold. We’re delighted to be able to incorporate Watch Register into Recipero’s Crime Reduction Ecosystem. This represents real value to Safer Gems and their members and of course enhances existing cooperation with UK Police. This collaboration is another positive step forward in assisting the Police service to work more effectively with the business industry, to identify and recover stolen property. The register is an easy to use and efficient way for officers to access information; I know it will assist in the conviction of many offenders to come. 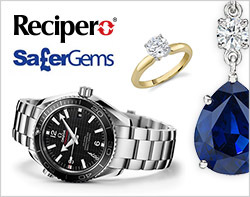 SaferGems members will further benefit through discounted use of Recipero’s CheckMEND service. CheckMEND, which forms part of many Police “Safe Seller Scheme” initiatives, enables traders of second-hand items to perform history checks to help mitigate the inherent risks of handling second-hand property. In the long-term, the Watch Register will help to reduce crimes against the jewellery industry by making it more difficult for thieves to resell stolen watches without getting caught. The British Security Industry Association is the trade association covering all aspects of the professional security industry in the UK. Its members provide over 70% of UK security products and services and adhere to strict quality standards. For more information see www.bsia.co.uk, email info@bsia.co.uk or telephone 0845 389 3889/020 7484 8728. The Sunderland Echo have reported that Police in the area are offering vital ‘sheducation’ to the public – in a bid to keep opportunistic burglars locked out. 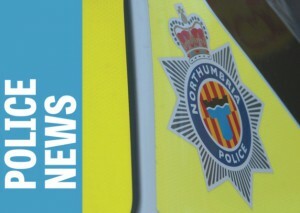 Crime-fighting cops in South Tyneside and Sunderland are reminding householders of the importance of shed security – after a recent surge in the number of sheds being broken into, with bikes being stored inside being the main target for crooks. People often don’t realise the value of the items they are storing inside their shed but if they’ve got expensive tools and bikes in there it all adds up and unfortunately, burglars are wise to this. Home security is vitally important and most people install security measures to protect their home however, they then don’t have adequate security on sheds and outbuildings leaving these types of buildings vulnerable to being targeted by thieves. A good quality lock could make all the difference over whether or not a burglar chooses to break-in to a particular building. Officers also say registering items that are stored inside the shed on national property register immobilise.com can help ensure it is returned to the owner if it is stolen. It also helps identify those involved in burglary. When we recover property we suspect has been stolen we will search immobilise to see if the property has been registered – if it has not only can we return the property but we can clearly identify the person in possession of the property as not being the owner and arrest them for handling stolen goods. York Police are fighting back against building site burglars – by making valuable tools and plant kit ‘too hot to handle’ with Immobilise. Following a spate of recent burglaries targeting building sites York Police are taking proactive steps to deter criminals and ensure property is easy to identify. Officers are attending a building site in Clifford Street, York, today (Tuesday 27 October) to security mark and log all equipment there, ensuring would-be thieves would find it impossible to sell on. The site was recently targeted by burglars, and police are now inviting other building firms in York to get their equipment marked too. Property on the site will be security marked using dot peen marking, in conjunction with the Hermes recording system to log it on Immobilise, the UK national property register database. Property marking sessions at other sites are also taking place, and officers are now inviting firms in York to get in touch so their equipment can also be security marked and registered. Getting your property marked – whether it’s plant kit, power tools, bikes or gadgets – is one of the most effective ways to protect it from criminals. The permanent marking will deter thieves, as it makes it far harder to sell on. It will also be much easier for us to return it to its rightful owner if it is lost or stolen, and could provide vital evidence to secure a prosecution. Plant kit and power tools on building sites can be worth thousands of pounds, which is why it’s so important to get it security marked and registered. We want the message to go out to would-be burglars that targeting sites in York is simply not worth the risk. Dot peen marking involves using a tungsten carbide-tipped pin to indent an object with dots to create a visible, permanent unique number. The unique number is entered onto the national Immobilise property register database. The dot peen machines in York were funded by North Yorkshire Police, the Police and Crime Commissioner for North Yorkshire, and Safer York Partnership. For more information, visit www.northyorkshire.police.uk/whatisdotpeen. Drop-in sessions for members of the public are promoted in the local press and on Twitter with the hashtag #whatisdotpeen, via the local team accounts @snayorkcityeast, @snayorknorth and @snayorkwest. Any businesses or organisations in York interested in getting their property marked should contact their local police team by dialling 101 and selecting option 2. We are pleased to announce that the full Recipero Crime Reduction Ecosystem is now available in the Netherlands. This will allow the public and organisations that buy and sell mobile phones to trade with confidence. The Recipero Crime Reduction Ecosystem is set for a rapid rollout as part of a joint venture between Recipero and PortingXS. The joint venture named ReciperoXS is already starting to help Dutch customers avoid the costs of handling compromised devices, protecting consumers and business alike from the costs of crime. In the UK and the US, these services have proven to be highly effective in identifying and reducing mobile device crime. PortingXS headquartered in the Netherlands, is a well respected provider of IT and Telecoms solutions throughout the world. Like Recipero, PortingXS has been established for 15 years and so brings a wealth of experience and connections that will help benefit both existing and new users. 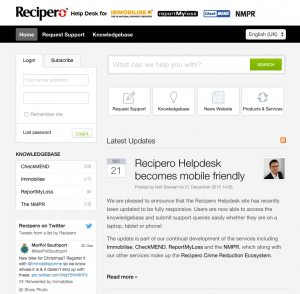 The expansion of our Ecosystem to the Netherlands is a great step for Recipero. The speed of rollout has been testament to the great synergies between Recipero and PortingXS. This has enabled our teams to translate and adapt our solutions to benefit Dutch consumers, businesses and law-enforcement. The platform, consisting of valuable information about mobile phones and other electronic devices, will be the link between consumers, retailers, police, insurers, banks and recyclers. Residents in south Liverpool are taking advantage of the Immobilise National Property Register to help them to protect their belongings, and deter burglars at the same time. South Liverpool Homes (SLH) has joined up with Merseyside Police to offer the free scheme to all SLH tenants. At the housing association’s monthly walkabout on Wednesday 6th May, staff chatted to tenants to make them aware of the scheme which aims to encourage people to register all their belongings on a national database. The landlord is making it as easy as possible for tenants to take part in the scheme by registering their belongings for them if they are unable to access the internet. This can include anything of value from mobile phone, tablets and game consoles to TV’s, bikes and watches. I thought this was a great idea so I jumped at the chance to register. It took about 15 minutes to do and now I have peace of mind that if any of my belongings do get stolen, there’s a good chance I’ll get them back. We are able to offer this service by working in partnership with Merseyside Police who will assist us with registering as many tenants as we can. Tenants can also register their belongings themselves by logging onto the Immobilise database where they will be given a secure login. Once registered, we ask tenants to tell us so that we can give people stickers to put in their windows which we hope will deter potential burglars. Police are urging people to get their new gifts logged to keep them out of the hands of thieves. And those who received iPads, iPhones and other similar smartphones and tablets for Christmas are urged to activate built-in GPS systems and download apps which help locate stolen property. The immediate crime prevention activity will mean if new property is stolen and later recovered it can be returned to the rightful owner, as well as potentially catching criminals in possession of stolen goods. The advice is part of Operation Soundwave – a campaign aimed at cutting volume crime and tackling opportunist thieves – which is ongoing over the festive season. Immobilise is the world’s largest register of property where members of the public can log their valuables – anything such as mobile phones, bikes, tools, electricals and gardening equipment. It’s free to register and takes just a few minutes to sign up. Ownership details can be viewed by police across the country on the National Mobile Property Register (NMPR), which allows officers to check a recovered item and instantly find the owner. Many people will have received devices such as iPhones, games consoles and laptops for Christmas and I’m sure crime prevention is not something which is at the forefront of people’s mind when they have just received gifts and are enjoying festivities. But I’d like to remind people that it’s important to take a few moments to take a note of the serial number and register with immobilise where an image can be uploaded and the serial number recorded. It means if it is stolen and recovered, it can be returned to the rightful owner as well as ensuring those found in possession of it can be dealt with, potentially preventing further crime. The more people that register with immobilise, the easier it is to return stolen property and the more difficult it is for criminals to profit from their crimes. Gadget-lovers are also being urged to make the most of tracking technology to stay one step ahead of thieves. We of course would urge everyone to protect their property from thieves in the first place, such as making sure phones are secured in zip pockets or handbags, not leaving items lying around on pub or cafe tables and never leaving electronic items on show in a vehicle. However, if such equipment is stolen, taking this simple step can make the difference between losing the item forever or having it tracked, located and seized by police. Modern technology has its place alongside the more traditional police work and we’ll continue to combine all investigative techniques to cut crime across Northumbria and stop thieves in their tracks. It’s also vital residents report anything suspicious to police straight away so they can investigate. Police can be called on 101, or to report a crime ongoing dial 999. Carmarthenshire Police Neighbourhood Development Team and Carmarthenshire Community Safety Partnership are working together with retailers to get electrical items purchased in stores uploaded onto www.immobilise.com at the point of purchase. Starting on Wednesday December 3rd, retailers will give customers the opportunity to register their new electrical and valuable items recorded and uploaded onto the national property registration site for FREE. Registration forms for www.immobilise.com accounts will be completed within the store with customers before being put online by Dyfed Powys Police officers. Once registered with an account the owners will then have the opportunity to add further property onto that account. The online Immobilise property registration system used by all UK police forces via the NMPR, and second hand traders via CheckMEND to check whether property that is recovered or offered for sale they come in contact with is stolen. If so it allows them to return it to the owners and also assists in bringing offenders to justice who are in possession of the property. The scheme is being rolled out to tackle the issue of victims not being able to provide full details of their property when it is lost or stolen. In addition it is hoped it will assist the police in bring those responsible for stealing property and handling the property to justice. Over the past few years we have adopted a very successful partnership with Carmarthenshire Community Safety and attended community events encouraging members of the public to take measures registering and securing their property. This has been reasonably successful, but by registering the property at the point of purchase it is hoped that even more people will benefit being signed up to www.immobilise.com. We have currently rolled this initiative out for Cycles with Halfords in Llanelli and Carmarthen and are confident our decision to expand the initiative to the other retailers will benefit all in our commitment to prevent crime. Humberside Police are working in partnership with ASDA at Mount Pleasant Retail Park to get electrical items purchased in the store uploaded onto www.immobilise.com at the point of purchase. Starting Sunday 31 August 2014, the store will give customers the opportunity to register their new electrical and valuable items recorded and uploaded onto the national property registration site for FREE. Registration forms for www.immobilise.com accounts will be completed within the store with customers before being put online by Humberside Police volunteers. Once registered with an account the owners will then have the opportunity to add further property onto that account. Immobilise is an online property registration system used by all UK police forces and second hand dealers to check whether property that is recovered or offered for sale they come in contact with is stolen. If so it allows them to return it to the owners and also assists in bringing offenders to justice who are in possession of the property. Over the past few years police have attended community events and other engagement opportunities to encourage members of the public to register all their property on the site. This has been reasonably successful, but by registering the property at the point of purchase it is hoped that even more people will benefit being signed up to www.immobilise.com. I am delighted that ASDA have agreed to offer this service and builds on the strong links we have the stores in this area. They were quick to get involved with Operation Sodium to assist the force in tackling retail crime and their support in hosting a wide range of crime prevention events in stores. If the immobilise registration proves a success in ASDA I hope other retailers will follow suit and look at the possibility of offering a similar service to their customers. A similar initiative was rolled out via Cycle shops in Hull in April and to date over 1000’s new cycles have been registered onto www.immobilise.com.